Over oatmeal and eggs on toast for breakfast? Katrina Ryan from The Golden Pig Food & Wine School is here to save your morning routine with this sensational savoury muffin recipe. She’s given us an inside peek at one of her favourite recipes from the new Great Australian Baking Book which features the best recipes from 80 top Aussie bakers! 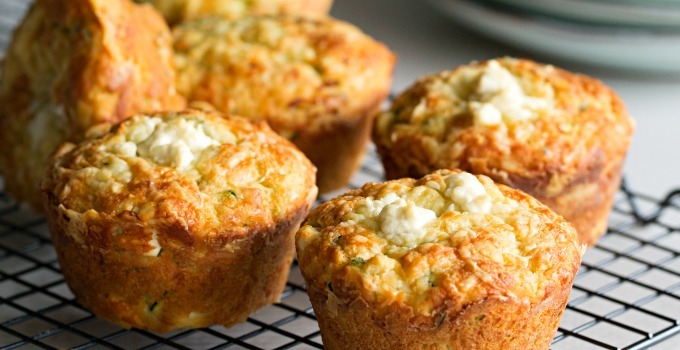 Make these zucchini, feta and mint muffins ahead of time for an on-the-go brekkie that’s definitely worth ditching the Vegemite toast for. 1. Oil and flour a muffin tin. Pre-heat oven to 180°C. 2. Rub flour, salt and two-thirds of the cheddar together with your fingertips until evenly dispersed. 3. Add feta, zucchini and mint. 4. Whisk together the wet ingredients (eggs, milk, yoghurt and oil) and fold into the dry ingredients. 5. Spoon into muffin tin and sprinkle with remaining cheddar. 6. Bake for 30 minutes, until golden on top.